Bigasoft iMovie Converter, a professional iMovie video converter, is especially designed to convert and fast import all movie clips in AVI, WMV, AVCHD, MTS, MKV, FLV, MOD, TOD, and more to an iMovie friendly format MP4 with great output quality on Mac OS X. With the video converter for iMovie, you can easily import MTS to iMovie, convert AVI to iMovie, import MOD to iMovie, and more. Fans are no longer restricted to footages played by QuickTime. CPU >1GHz Intel or PPC CPU. 512 MB RAM or above. ...... With the video converter for iMovie, you can easily import MTS to iMovie, convert AVI to iMovie, import MOD to iMovie, convert MPG to iMovie, and more. Because iMovie uses QuickTime to process video and audio footage, you are restricted to work with footage from rare formats including DV, DV Widescreen, HDV, MPEG-4, iSight. To work with any movie clips in iMovie, you need to convert movie formats including AVI, DivX, Xvid, ASF, WMV, MKV, MPEG, RM, RMVB, VOB, 3GP, FLV, MOD, TOD, MOV, AVCHD, MTS, M2TS, MP4, H.264, and more to iMovie compatible format MP4 for fast import to iMovie with the powerful conversion utility for iMovie. 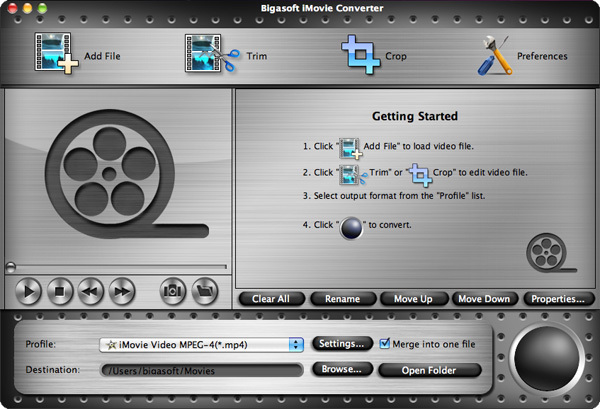 Bigasoft iMovie Converter helps to easily convert all your videos to MPEG 4 for fast import to iMovie '09 or import to iMovie '08. A professional Mac video to PSP converter. Qweas is providing links to Bigasoft iMovie Converter for Mac 3.4.2.4195 as a courtesy, and makes no representations regarding Bigasoft iMovie Converter for Mac or any other applications or any information related thereto. Any questions, complaints or claims regarding this application Bigasoft iMovie Converter for Mac 3.4.2.4195 must be directed to the appropriate software vendor. You may click the publisher link of Bigasoft iMovie Converter for Mac on the top of this page to get more details about the vendor.